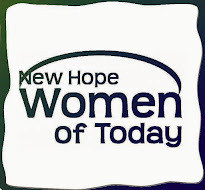 New Hope Women of Today: Let's Grow Ladies! The best part about volunteer organizations like NHWT is the opportunity for growth that it offers. We-all want to make positive contributions to our communities-Most of us join organizations like-NHWT to help out with causes that are in place. We hear about the Cooper Craft Fair and think, "I could help with that". So we join and sign up to serve coffee, to clean the Highway, run a kiddie game at Duk Duk Daze or show up to a fun social event. The next year we may help out with the 5K or attend Bow Night. I was one of those members. At one point I was asked to be on the DDD Committee as the prize person. I had no idea what I was getting into. It ended up being a fun job. Everything from the previous years were handed to me in a file. I only had to pick out new prizes, keep track of my spending and keep an inventory of what we used. I successful and I know I made a significant contribution to the event and our organization. This year I took on the coffee shop for the Cooper Craft Fair. Although it seemed like a lot to take on, all I had to do was follow the format that was in place from last year. I had to make a few adjustments, but not much stress involved. The hardest part was not knowing what to expect on the day. The past chairperson was at the meetings and was available for questions at any time. Next year it will be easier as I will know what to expect. This year I also took on the role as Treasurer. Now this, for me, was a stretch! I have no accounting skills. I don't even balance my checkbook. I do, however, keep track of my family's expenses and pay all of the bills. I have found that NHWT banking duties are a little more complex. But I'm doing it! The former Treasurer helped me get started and is available if I have problems. And my fellow board members have, been supportive and encouraging. Even though there are times when I feel like I'm not sure what I'm doing and times when I feel like my numbers are way off, I know that I am doing my best. I think my numbers are at least close to accurate, I am proud of myself for trying something outside my comfort zone and I know that I am backed by a whole group of amazing women. Soon, we will be looking for a new president and new board members. I encourage any of you to consider taking on a position. Anything. Or commit to chairing an event or serving on a committee. When we try new things, we grow in ways we never expect. ( Now is the time to ask questions without feeling any pressure.) Let's grow together!